Pain Quarterly is an informative guide covering different types of pain and the multiple treatments available for each condition. Unfortunately, many people suffer from chronic pain and most of them are untreated and perhaps even undiagnosed. Most people, including many health care providers, are not fully aware of the existing and emerging options that are now available to them. The goal of Pain Quarterly is to inform people about the various types of chronic pain and what can be done to manage one’s pain. Too many people suffer unnecessarily. Whether you are the one in pain or you know someone who is, this publication can help! Pain Quarterly is a free resource for anyone who is interested in learning more about various pain conditions, ways to manage them, and even treatments to help relieve the pain caused by these conditions. 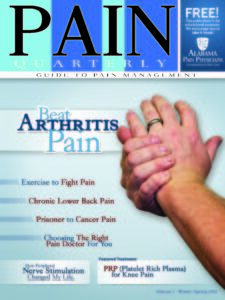 The first issue of Pain Quarterly, Beat Arthritis Pain, focuses on the diverse types, causes, preventions and treatments of arthritis. Arthritis effects people of all ages and while it is an extremely common disease it is not very well understood. Throughout this issue, we discuss the difficulties of living with arthritis and various ways people can reduce the pain it causes. Because this is our winter and spring issue, we have highlighted a few exercises and activities that we recommend to help prevent injuries during the colder season’s of the year. Other articles that are included in this issue are “Find the Right Pain Doctor for You” and “Eat Your Medicine: Food for Pain Relief”. These articles are important resources for individuals with any kind of pain condition. The remainder of the magazine offers real life experiences from individuals suffering from arthritis, including personal insights into how they have successfully managed their arthritis pain. 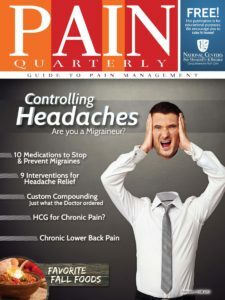 The second issue of Pain Quarterly, Controlling Headaches: Are you a Migraineur?, focuses on the various types, causes, preventions and treatments of headaches. Headaches can be difficult to treat and come with many challenges. Throughout this issue we discuss those challenges and explore the options that are available to individuals that are prone to headaches. Being our summer and fall issue, we highlight different exercises and activities, like swimming, that are common for these seasons and help promote health benefits. Also included in our second issue are a few previous articles, “Chronic Back Pain” and “Is a Block a Block?”. These articles are a great reference to other common pain conditions that we treat at Alabama Pain Physicians. The remainder of the magazine will highlight various pain syndromes and include real life stories related to pain management.